How many nights did I spend as a kid, laying in bed on a stuffy summer night under just a sheet with the rest of the blankets bunched down by my feet, trying to ignore the humidity, and listening to the voice of a man from Georgia who had been transplanted into Detroit to call baseball games for the Tigers? 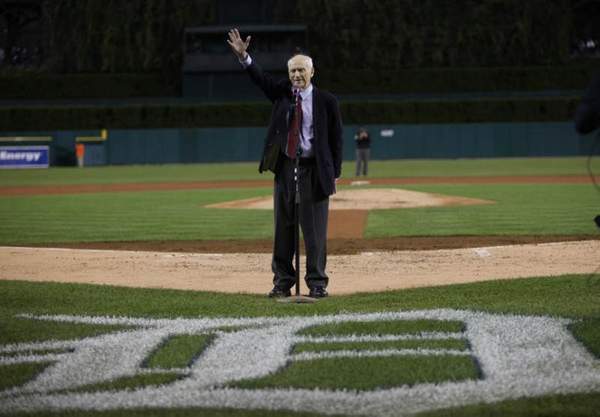 Ernie Harwell, along with his broadcasting partner Paul Carey, taught me to love baseball. Ernie taught me the cadences of broadcasting, the rhythm of the game, and the amazing power of the spoken word to break down the reality he took in with his eyes and send it hundreds of miles over the air to be reconstructed in vivid detail in my mind. He was an artist – a genius with words – and I have never heard a voice like his since he left the broadcast booth. Just prior to my high school graduation, I received a letter in the mail from the Ernie Harwell Foundation; it informed me that I had received a $500 scholarship. It was completely unexpected – it turned out that I had been nominated for it by an english teacher. I was thrilled to have received a letter signed by the man himself, and honored. A few years later, I was working at the local sports radio station as a producer on the morning show and got to call Ernie at his home in order to get him on the line for a scheduled interview. I took the opportunity to thank him for that scholarship, and I remember how humble he was in response. The Foundation had apparently been shut down at that point, but he told me how pleased he was that he could help a number of young people in some small way. He went on to do his interview on the show, which was great as usual – the guy had a million fantastic stories to tell – and that was that. I got to talk to Ernie Harwell on the phone. What a thrill. Ernie Harwell’s voice is a treasured part of my life. That voice has been silenced now, but it will live on in my memories. My thoughts and prayers go out to his beloved wife Lulu and the family he leaves behind.